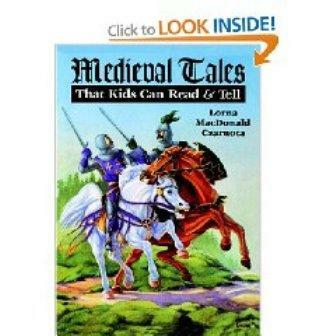 Short medieval stories for kids are entertaining and educational. Many of the tales have been circulating for generations, while others are new creations. Parents can begin by introducing young children to picture books with medieval themes. In time, books about the Middle Ages that are more complex can be introduced. Age-appropriate reading materials that have medieval themes can be thrilling for kids. Consider some of the elements found in medieval literature. Horses, dragons, knights and maidens appeal to girls and boys of various age groups. They can be found in short easy fairy tales. Books for young children can develop interest in this period of history. A Medieval Feast by Aliki is a short medieval tale about preparing for a king's visit. The colorful book takes kids through Camdenton Manor as its inhabitants prepare for a great feast. The book is ideal for kids ages 4 to 8 years old, but younger children may enjoy it. In the Castle by Anna Milbourne is a nice book for preschoolers that takes them on a tour of a medieval castle. The short story follows the adventures of a little boy who wants to become a knight. The Middle Ages was a dreary and mysterious time that yields many dark tales. Books for older kids help develop a sense of wonder about this gloomy period while weaving threads of humor and joy into the stories. In addition, the stories are organized by region and readers have the opportunity to explore life in the middle ages through the historical fiction. The book includes a "How to be a Medieval Storyteller" that offers tips for delivery. Another great feature in Medieval Tales that Kids Can Read and Tell is the glossary of medieval terms as well as a healthy list of sources for quick reference. The book is ideal for kids ages 9 to 12 years old. Good Masters! Sweet Ladies! Voices from a Medieval Village by Laura Amy Schlitz takes a similar approach as Czarnota's book, but the stories are written from the characters' point of view presented in monologues. The reader takes the character's perspective in each tale as the stories bring experiences in the Middle Ages to life. The monologues are interconnected and include both poetry and prose. Voices from a Medieval Village is a wonderful choice for the classroom or for a child's library. The book has many appealing features including notes that make the monologues easier to understand. Ideal for children 10 and older, the book is a great stepping-stone between children's literature and stories that require notes such as Beowulf and Shakespearean plays. Favorite Medieval Tales by Mary Pope Osborne and Troy Howell is a beautiful collection of short stories from the Middle Ages written for children ages 9 to 12 years old. The stories are so well crafted that many teens and young adults may find the collection intriguing. The language is a blend of poetic devices and captivating prose with a peppering of archaic words and phrases.The illustrations in Favorite Medieval Tales are magnificent and they appear to be authentic with muted colors and intricate detail. Pages are adorned with meticulous borders and subtle accents that give them a sense of antiquity. This book is a wonderful choice for developing an interest in etymology and medieval art. While fiction may bring images of tall tales and untruths, even a very short children's story can be a great vehicle for learning. Short medieval stories for children bring different aspects of life in the Middle Ages to light as children learn about the experiences people during this era had. This is something that goes beyond learning names and dates about a period in time.